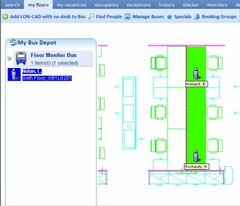 Floor Monitor is used to manage the locations of staff, correct headcount and occupancy and vacancy data. A Floor Monitor is either assigned by building, in which case, the Floor Monitor will have access to all the floors and desks within the building, or by division, where it will have access to any desk allocated to that division and any floor or building in which they appear. When the Floor Monitor is selected, by default you access the My Floors page. First you need to select the correct profile. This is set by the administrator. From the drop down you can select the building or in fact, divisions in a particular building that you are permitted to monitor. You will then be able to select applicable floors from the location filter and if you wish to see all locations or just desk locations. The loaded plan locations are coloured by department allocation. You will only be able to view departments within the divisions that you are able to monitor. All other locations will not be shaded. Placing the mouse cursor over a desk will show further details about the corresponding location. 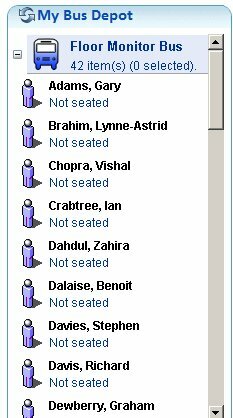 You can also choose to show employee names, locations which are currently occupied and locations marked as voids (unoccupied locations) by using the Show Labels settings. 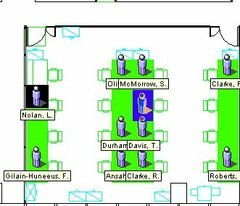 To move an employee on the same floor, left click and hold to drag the employee icon from their existing location to their new location within your monitored area. If they are moved to an area allocated to a different department within the division, the allocations of the new locations will be automatically updated. 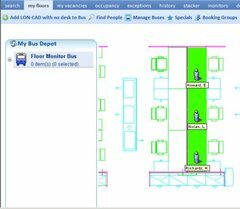 If you need to move an employee between floors, you can use the temporary holding area of the Floor Monitor Bus. 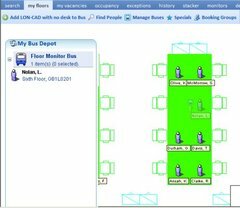 Each user of the system has their own personal Monitor Bus which holds people that they are moving and is shown in the left-hand area of the My Floors screen. 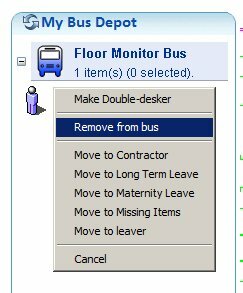 Drag the employee icon onto the floor monitor bus in the same way as if you were moving them to a new desk. It will show a small arrow and a bus icon on the desk to show they are moving to the bus. Change the floor displayed to the new floor using the location filter. Then drag the employee icon off the Floor Monitor Bus to the new location in the same way as moving them on the same floor. 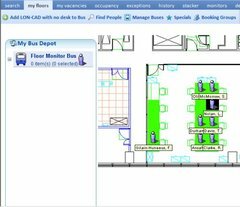 If you need to return an employee to their original location from the bus locate them on the floor plan and right click. Select remove from bus and they are removed from the floor monitor bus and returned to their location. The arrow showing them moving to the bus is removed. There are a number of further functions available as part of the Floor Monitor bus. Add DIVISION with no desk to the bus. This will add all employees who have no allocated location and belong to the division that is being monitored to the bus. 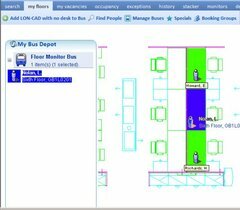 Manage Buses launches the bus manager window. 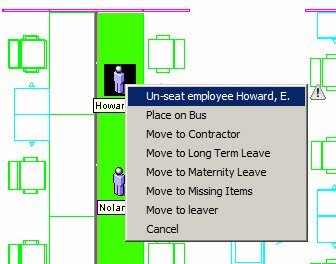 In the bus manager window you can select employees and delete them from the bus. Specials launches the special bus window. Special Buses are additional buses that can be used to hold employees with special circumstances such as long term absence or maternity leave. If a member of staff has more than one location, they need to be copied rather than moved. 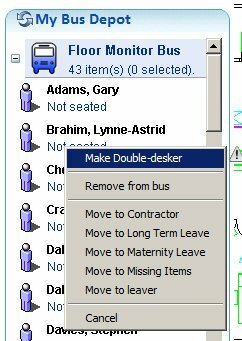 To do this first move the employee to the bus then right click on the employee icon in the bus and select Make Double Desker. The employee can then be dragged onto a new location except that they are not removed from the bus when moved, so this can be repeated for each desk they require. To search for an employee, first ensure that the location filter is set correctly for the employee you are searching for. Complete the Search Criteria with as many details known, using the search to locate a department if required. The search will return all partial matches. You can include vacancies in the search results to also show desks that are not currently occupied with their vacancy reason. You can exclude passengers already in the bus from the search results. You can select records from your search result and add to bus that belongs to you, or to other users. 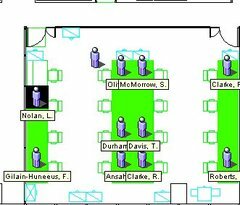 To manage the allocation of desks to departments, select the Floor Monitor link from the installed modules and then select the correct profile. This will launch the department search. The division you are monitoring will already be selected and cannot be changed. It will list all the departments assigned to the division. Click on the required division, the window will close and the department will be updated to the new department. Selecting the Exceptions page will display all the locations where the department of the assigned employee does not match the department allocated to that location. Sometimes when an exception is fixed it still appears in this list. The cause for this is when there is more than one employee allocated to a location and they have different departments. If you look carefully you will notice that the name of the employee changes when you fix the allocation as it matches to one employee, and then does not match the other. To manage the reason for desk vacancies select the Floor Monitor link from the installed modules and select the correct profile. When the Floor Monitor is selected then access the My Vacancies page. Select the floor using the location filter. Once you have selected a floor it shows the locations within your monitored area highlighted by different colours which correspond to the list of Vacancies on the floor. You can fix all incorrect occupancies automatically using the reset floor tool bar. Once you have set your requirements, click on reset floor. To change the vacancy reason, right click on a location and choose a new vacancy reason, or remove the vacancy reason from the desk. You can also select multiple locations at a time by selecting each in turn and then right clicking on the last desk. You can generate a quick report to obtain an overview of your occupancy and vacancy. Select the Floor Monitor link from the installed modules list and select the correct profile. When the Floor Monitor is selected then access the Occupancy page. You will then be able to select applicable floors from the location filter. The Vacant Desk report shows desks by vacancy. There is a pie-chart that shows the breakdown of all the desks in the selected location, with a key for the report with total counts. 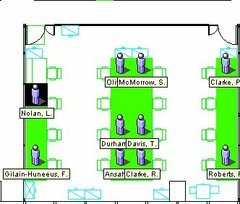 The bars are grouped by floor, with the same colour as the key, giving a total occupancy out of all available desks, highlighted against a 15% threshold. The Department Desk report shows desks by departments. The bars are grouped by department, with the same colour as the key. 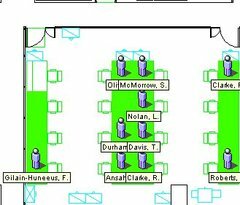 By hovering over a particular part of the bar you can see which department it is and how many seats they occupy. The history page is another quick report page which gives you access to historical data. Locator has always allowed the dumping of allocation data on a regular basis so that divisional allocations can be analysed over a period of time. This is, of course, extremely useful for helping to predict future requirements. The Tool Bar set up is very similar to the Occupancy quick reports discussed above. There is a Run Query button to rerun the report when you change area/division and a series of drop down lists which allow you to specify the data that you want to see. Also note that like the occupancy report you will be limited to a single division (or building) depending on your current profile unless, you have been given admin rights. Each section of the report provides a profile for a single division within the light blue rectangle. Quarter by Quarter figures (with % increase / decrease) are shown on the left and a bar chart or space allocated is shown on the right. Admin users have additional levels of access beyond that of a normal user. If you are an admin user can set allocations for any location on a given floor by selecting the Floor Monitor link from the installed modules list and selecting the Allocations page. The allocations page shows the divisions on the floor and a floor plan showing allocated location in corresponding colours. By selecting some, all or none of the divisions on the floor, the floor plan will update to only show the selected divisions. Any location can have its allocation changed by right clicking on the location. You can also select multiple locations at a time by selecting each in turn and then right clicking on any of the selected desks. You can quickly set a desk to the default departments which are listed or you can allocate it to a department already on the floor by selecting From Floor, then selecting from the Divisions and Departments already allocated on the floor. Or you can select an entirely new department by selecting More and using the search to find your desired department. An admin user can manage the access rights of floor monitors. Select the Floor Monitor link from the installed modules list and select the Monitors page. To add a new user, use the Search to find the user and then click Add User. To delete a user, select the user and click Delete. Alternatively, you can set a user to have identical permissions to an existing user by selecting the user and the user to copy from, then click Clone User From.